At panels in the TCA Winter Tour, truTV have announced premiere dates for the eighth season of Impractical Jokers and brand new series Tacoma FD. Now entering its eighth season on truTV, the unscripted Impractical Jokers television series features four comedians and lifelong friends who compete to embarrass each other out amongst the general public with a series of hilarious and outrageous dares. When Sal, Joe, Q, and Murr – collectively known as the popular comedy troupe The Tenderloins – challenge each other to say or do something, they have to do it. And if they refuse, they lose. At the end of every episode, the biggest loser must endure a punishment of epic proportions. Following the Season 8 premiere of Impractical Jokers, truTV will introduce its newest original series, Tacoma FD. On the heels of the breakout theatrical release of Super Troopers 2, co-creators and stars Kevin Heffernan and Steve Lemme will be donning new uniforms in the half-hour comedy, which is set in a firehouse in one of America’s rainiest cities. Light on blazes that need extinguishing, this crew keeps themselves entertained with creative competitions, friendly first responder rivalries, and bizarre emergency calls. Leading firehouse shenanigans in the 10-episode first season are Chief Terry McConky (Heffernan) and Captain Eddie Penisi (Lemme), alongside an eclectic crew played by series regulars Hassie Harrison (Southbound), Eugene Cordero (Black Monday, The Good Place)Marcus Henderson (Get Out, Homecoming), and Gabriel Hogan (Heartland). Rounding out the cast of Tacoma FD are guest stars Suzy Nakamura (Dr. Ken), who portrays an eager councilwoman with no patience for tomfoolery, and Heather Mazur (Insecure) as Chief McConky’s wife and Captain Penisi’s sister. Jimmy Tatro (American Vandal), Maria Russell (Lights Out) and Jamie Kaler (My Boys) will also guest star as members of the Tacoma Police Department (PD), Tacoma FD’s first responder rivals. Additional guest stars throughout the season include: Super Troopers co-creator and star Paul Soter – who also serves as a writer and consulting producer forTacoma FD – as well as JD Pardo, Nat Faxon, Martin Starr, Will Sasso, Christopher Neiman, Kevin Pereira and the Impractical Jokers’ own Brian “Q” Quinn. 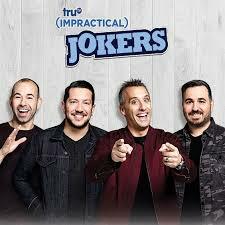 Impractical Jokers is produced for truTV by NorthSouth Productions with Charlie DeBevoise, Pete McPartland Jr., Joe Gatto, James Murray, Brian Quinnand Sal Vulcano serving as executive producers.